Healthcare Video | Donnegan Systems Inc.
See how Donnegan Systems can help with your medical storage needs and help increase efficiency and productivity in your healthcare practice. Growing numbers of patients in hospitals and clinics are creating a greater need for skilled staff.At the same time, the number of doctors and nurses are at an all-time national low. For practitioners, there simply aren’t enough hours in the day—and the majority of that time is spent charting vital signs, stocking supplies, and cleaning. When we ask nurses what they love about their jobs, they consistently say working with patients. In short, there’s a disconnect. We help your staff focus on the quality of patient care, because the right healthcare sterile storage solutions make a significant impact in freeing up time and space. The best healthcare practitioners are streamlining processes to provide quicker access, efficiency, and organization to all aspects of their work—and that’s how we can help. For nearly 40 years, we’ve worked with medical professionals to design storage systems that take into account their current processes and solve their biggest challenges. Healthcare isn’t just about the diagnosis and treatment of illness—it also refers to the equipment, instruments, services, and substances that make health possible. Pharmaceuticals and biopharmaceuticals are experiencing tremendous growth in the United States, particularly in the New England area—and with that, the need for healthcare sterile storage that is temperature-controlled for vaccines, compounds, and gene therapies has become increasingly important. 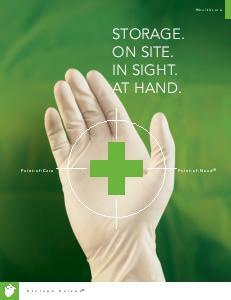 Download our brochure to view all Healthcare storage solutions. You will receive a link to download this free brochure, and your email will not be sold or shared. Donnegan Systems has helped medical professionals across New England and Eastern NY. Let us show you how to look at space a whole new way.